Sussex Air Ambulance responded to an overturned lorry in Shoreham this morning (August 29). A police spokesman said emergency services were called to a recycling centre in Kingston Wharf in Brighton Road at 9.20am. 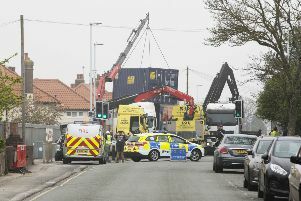 A lorry had rolled over while unloading at the centre, said police, injuring the driver. The air ambulance landed nearby and, after being rescued from the vehicle, the driver’s injuries were not thought to be life-threatening or life-changing, police said. They said the Health and Safety Executive, the body responsible for the regulation and enforcement of workplace health and safety, had been informed.